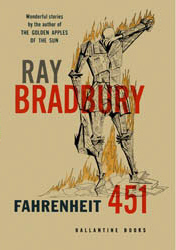 I just re-read Ray Bradbury’s “Fahrenheit 451.” Many have said it’s about censorship, but it’s not, at least at the core. It touches on anti-intellectualism and a society which lets itself — not solely by governmental influence — fall into a state of disrepair while attempting to find happiness in a grossly distorted, vapid commonality. Picture it. Nineteenth-century man with his horses, dogs, carts, slow motion. Then, in the Twentieth Century, speed up your camera. Books cut shorter. Condensations. Digests. Tabloids. Everything boils down to the gag, the snap ending. Classics cut to fit fifteen-minute radio shows, then cut again to fill a two-minute book column, winding up at last as a ten- or twelve-line dictionary resume. I exaggerate, of course. The dictionaries were for reference. But many were those whose sole knowledge of Hamlet … was a one-page digest in a book that claimed: ‘now at least you can read all the classics; keep up with your neighbours.’ Do you see? Out of the nursery into the college and back to the nursery; there’s your intellectual pattern for the past five centuries or more. With school turning out more runners, jumpers, racers, tinkerers, grabbers, snatchers, fliers, and swimmers instead of examiners, critics, knowers, and imaginative creators, the word ‘intellectual,’ of course, became the swear word it deserved to be. You always dread the unfamiliar. Surely you remember the boy in your own school class who was exceptionally ‘bright,’ did most of the reciting and answering while the others sat like so many leaden idols, hating him. And wasn’t it this bright boy you selected for beatings and tortures after hours? Of course it was. We must all be alike. Not everyone born free and equal, as the Constitution says, but everyone made equal. Each man the image of every other; then all are happy, for there are no mountains to make them cower, to judge themselves against. So! A book is a loaded gun in the house next door. Burn it. Take the shot from the weapon. Breach man’s mind. Who knows who might be the target of the well-read man? Me? I won’t stomach them for a minute. And so when houses were finally fireproofed completely, all over the world (you were correct in your assumption the other night) there was no longer need of firemen for the old purposes. They were given the new job, as custodians of our peace of mind, the focus of our understandable and rightful dread of being inferior; official censors, judges, and executors. That’s you, Montag, and that’s me. Clarisse McClellan? We’ve a record on her family. We’ve watched them carefully. Heredity and environment are funny things. You can’t rid yourselves of all the odd ducks in just a few years. The home environment can undo a lot you try to do at school. That’s why we’ve lowered the kindergarten age year after year until now we’re almost snatching them from the cradle. We had some false alarms on the McClellans, when they lived in Chicago. Never found a book. Uncle had a mixed record; anti-social. The girl? She was a time bomb. The family had been feeding her subconscious, I’m sure, from what I saw of her school record. She didn’t want to know how a thing was done, but why. That can be embarrassing. You ask Why to a lot of things and you wind up very unhappy indeed, if you keep at it. The poor girl’s better off dead. Luckily, queer ones like her don’t happen, often. We know how to nip most of them in the bud, early. You can’t build a house without nails and wood. If you don’t want a house built, hide the nails and wood. If you don’t want a man unhappy politically, don’t give him two sides to a question to worry him; give him one. Better yet, give him none. Let him forget there is such a thing as war. If the Government is inefficient, top-heavy, and tax-mad, better it be all those than that people worry over it. Peace, Montag. Give the people contests they win by remembering the words to more popular songs or the names of state capitals or how much corn Iowa grew last year. Cram them full of non-combustible data, chock them so damned full of ‘facts’ they feel stuffed, but absolutely ‘brilliant’ with information. Then they’ll feel they’re thinking, they’ll get a sense of motion without moving. And they’ll be happy, because facts of that sort don’t change. Don’t give them any slippery stuff like philosophy or sociology to tie things up with. That way lies melancholy. Any man who can take a TV wall apart and put it back together again, and most men can nowadays, is happier than any man who tries to slide-rule, measure, and equate the universe, which just won’t be measured or equated without making man feel bestial and lonely. Bradbury much later brushed attributions of censorship themes aside, stating the story was more about the dumbing-down effect of television. However, I find the book to be much more than just how media may be dumbing us down. In it are also strong themes of grappling with social acceptance, anti-intellectualism, and personal happiness, just as there are notes on “tuning out” with vapid entertainment, as well as self-imposed censorship. Despite being almost 60 years old, the particulars of the story — regardless of how you wish to interpret them — all seem extremely relevant to America, 2012. The musings on education are particularly poignant given today’s current educational atmosphere. For example, Bradbury’s antagonist goes on about filling students “so damned full of ‘facts’ they feel stuffed, but absolutely ‘brilliant’ with information.” Sound familiar? Searching the news on any given day will reveal complaints of how students regurgitate rather than understand. In Bradbury’s characters’ world, higher education is cranking out more athletes than creatives and intellectuals. Maybe that sounds familiar also? It should: this is another hot topic of debate in higher education, with people on both sides of the table. That said, “Fahrenheit 451″ is definitely worth a read and then some self-reflection. It’s a book that remains significantly relevant to our times. Afterwards, it leaves us to ask “could we slowly be headed down the same path?” Bradbury frequently saw signs of it after writing the book. Do you? Or will his science fiction world remain purely that: fiction?